Racing at Abu Dhabi on Sunday is highlighted by a quality renewal of the 1200m Group 3 Al Ruwais in which the weights are headed by ES Ajeeb, undoubtedly one of the fastest Purebred Arabians in the UAE, but considered a better performer on dirt as opposed to the turf in the capital. However, the 5-year-old son of Big Easy, himself winner of this in three consecutive seasons between December 2002 and January 2005, has won on the Abu Dhabi turf, over 1600m which was plenty far enough for him, so we should be able to expect a bold showing. Owned and bred by Sheikh Abdulla bin Majid Al Qassemi, chairman of the Sharjah Equestrian & Racing Club, he has been a real star for his trainer, Ibrahim Aseel and regular jockey, Sam Hitchott. The pair were never headed in the 1400m Group 3 Bani Yas on the dirt at Meydan on their penultimate start and, more recently, over 1200m on home dirt in the HH The Crown Prince of Sharjah Cup. Among the opposition is Wadeeaa, winner of the 1600m Group 1 Al Maktoum Challenge R1 during the second fixture of the Dubai World Carnival. She was never headed in that dirt feature, providing trainer Mohamed Ali with his first winner of the season and a biggest ever career victory for jockey Szczepan Mazur. Homebred by Sheikh Mansour bin Zayed Al Nahyan, the 5-year-old mare has won on turf in Europe, but has never tackled a trip as short as 1200m before. Jean de Roualle won this last year with Rmmas, owned by Yas Horse Racing Management and partnered by Richard Mullen. This year, that combination are represented by Mirna, a 7-year-old mare who has finished behind both Wadeeaa and ES Ajeeb at Meydan on her two starts this season. However, her one previous local outing, her UAE debut, was in this race last year when running on in fifth, but without ever threatening to land a blow. 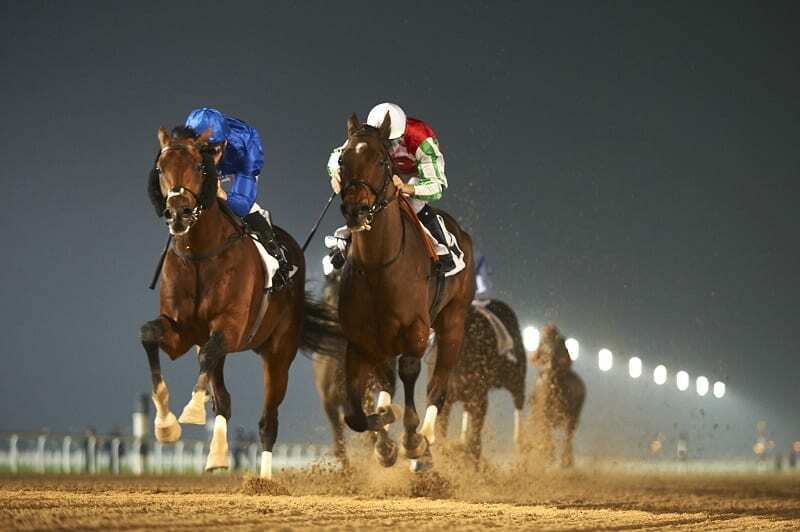 The main support race is the 1600m Group 3 Abu Dhabi Equestrian Club Gold Cup, restricted to horses foaled in the UAE and won last year by Al Tiryaq, ridden by Hitchcott for Abdallah Al Hammadi and his main patron, Al Ajban Stables. If he can defend his crown he will emulate Saken, who landed three consecutive renewals between 2003 and 2005, as well as Abhaar, victorious in 2015 and 2016. The latter was among the entries this year for Sheikh Khalifa and Lemartinel, but the trainer has opted to rely on Shaheer, the choice of Pat Cosgrave, and Mukaram, who will be ridden by Fabrice Veron.